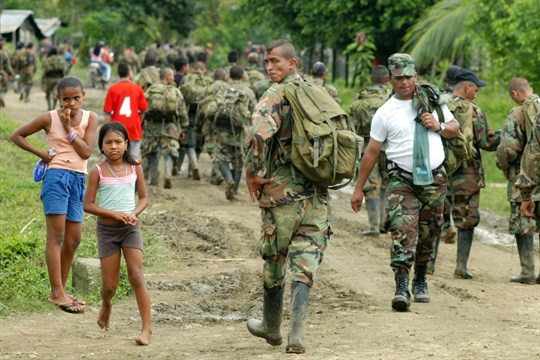 Paramilitary fighters from the “Banana Bloc” arrive at a rural area outside the northwestern Colombian town of Turbo to turn in their arms, Nov. 21, 2004 (Photo by Julio Cesar Herrerea for El Tiempo via AP Images). In this week’s Trend Lines podcast, WPR’s editor-in-chief, Judah Grunstein, and managing editor, Frederick Deknatel, discuss the implications of the upcoming second summit between U.S. President Donald Trump and North Korean leader Kim Jong Un, and the potential consequences of a content-free diplomatic process. For the Report, Mariana Palau talks with WPR’s senior editor, Robbie Corey-Boulet, about Colombia’s post-conflict land restitution program, which is not only struggling in its mission to help landowners reclaim property that was stolen during the country’s civil war, but is also in some cases driving a new cycle of displacement. Can the U.S. and South Korea Stay Aligned on North Korea Sanctions?